For the first time in a very long time I sat down yesterday-- and stitched; on my brand-new, inherited, vintage Singer 301. After lovingly oiling her this past weekend, and adding some motor lubricant to the teeth of the gears, she purrs like a kitten and makes a most impeccable stitch. It took me all of, hmmm... let's see, ten seconds to get used to the sewing posture for this one. There is a knee-lever which controls the (mounted inside the cabinet) foot pedal; for the last twenty-plus years I have been sewing on Berninas where the knee lever controls the presser foot up/down. I adjusted quickly to the change. There is a handy little cross piece along the inside bottom of the cabinet on which to comfortably rest my foot. I adore this machine, I have named her Ruth. When it was time for me to bring her home to live here my husband innocently asked: "where will this machine go?" I answered, immediately, "in the sewing room, of course." "Is there room?" he continued. "I will make room" was my reply. And I did. I have two other cabinet machines situated in the center of the room. 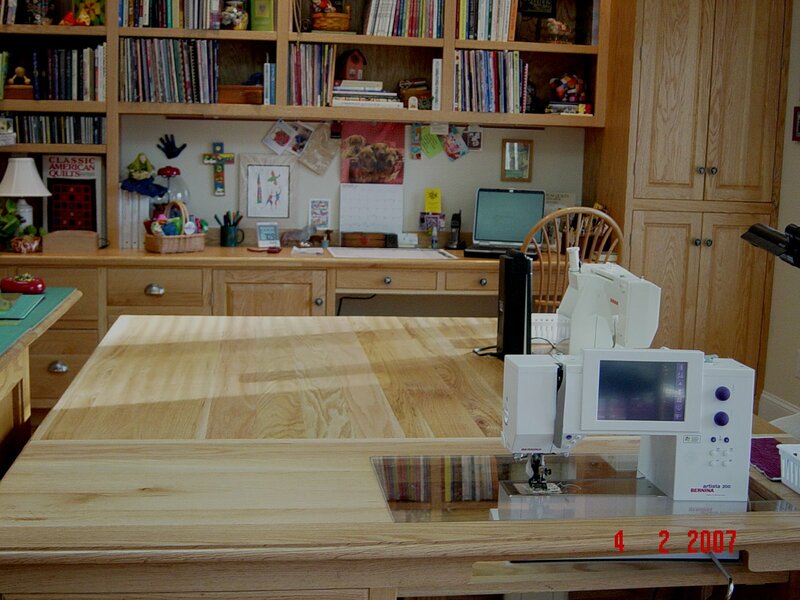 This picture is from ten years ago, when Mr. Goodneedle built this tree-part table for the machines and storage. It is well used and much loved. Ruth and her first real project since arriving at Chez Goodneedle, a pillow case for Ryan's Case for Smiles. Ruth entered this space quietly and graciously, she fits nicely right in front of the window and gives me a wonderful view of the bird feeders just beyond the side porch. My other machines haven't been one bit jealous of Ruth's arrival, they have deferred to her senior status; there's been no pushing or shoving for top-dog status. This relationship is one of harmony and cooperation. The comings and goings just outside the window, at the finch feeder on the other hand, are the exact opposite. These pretty little birds are quite aggressive with one another vying for a place of their own at the table. They could learn a lesson from Ruth if only they just peeked inside, there's room for everyone to coexist peacefully, if they would only wait their turn. Hello, Ruth is simply charming and so classy! I got a new Singer Treadle this year, but it's out in the family room-haven't even tried her yet. Hubby refinished the cabinet and she looks amazing, as does my original treadle. But I have to say I'm going to show my hubby your table-b/c about 12 years ago he promised to make me a set of drawers and table for my machine. I just use a computer desk and it is impossible to do machine quilting on it-but then again, I only do small projects, because I'm not a master. Thanks for sharing Ruth with us. Sending Easter blessings to you and yours. It is so nice that Ruth has a new, loving home. What a wonderful sewing room. I love the table your husband built! HI Ruth!!! Your mom makes lovely quilts...you will need to keep up with her, LOL! Simply beautiful - welcome Ruth! Love the story and the happy ending! Welcome Ruth! Such a lovely addition to your family. I'm glad you are stitching together. My poor little Featherweight, Flossie, sat on a shelf for far too long after she came home with me. We're now stitching together, and she is a delight! Earlier this week, I whipped up a lovely dust cover for her, and she's feeling much more comfortable. There's plenty of work for everyone, so no need for jealousy here, either. That is such a fabulous machine. I have one too and absolutely love it. Of course you can find room for a gem like that. Ruth looks very comfortable in her beautiful new home, as if she has been there all her life. Love your room. Love your analogy with the birds, and there being room for everyone, a good world lesson for all?